On Monday night we went over to La Rabiniere at Betz-le-Chateau to a book talk organised by the “Champs des Livres” association. 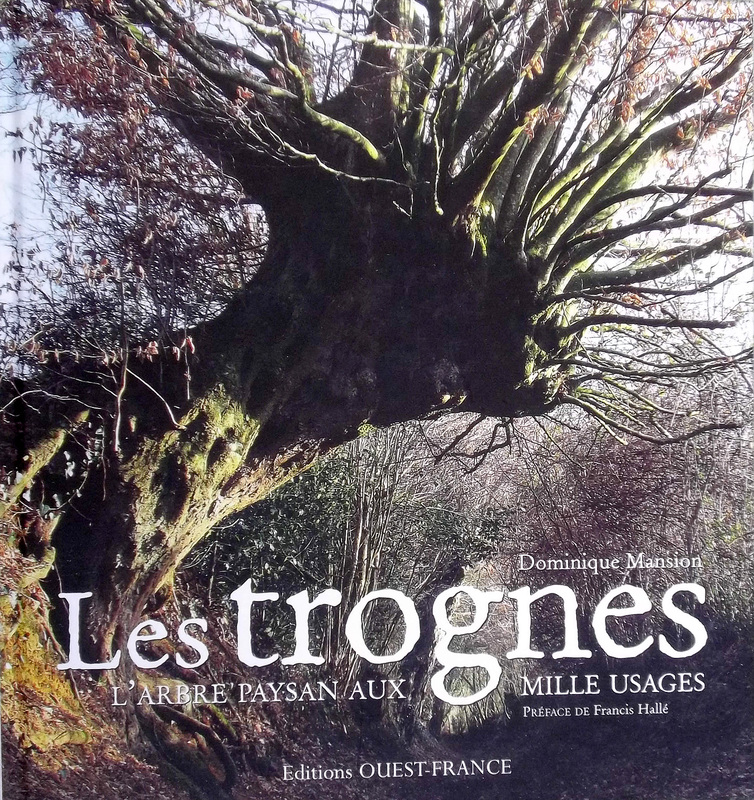 The author was a man passionate about “Les trognes” which is the main title of his book. The passionate man was Dominique Mansion who founded and runs the Maison Botanique at Boursay in Loir et Cher. I pollarded our old willows because I love trees and knew that they were old and needed a haircut… I was also aware of the wildlife that a pollarded tree supports… but my knowledge pales beside Dominique’s! He spoke of the history of the pollard, the reasons, the wildlife… he spoke quietly, intensely and with burst of loud emphasis. He was utterly captivating… so much so that I would have bought the book afterwards… if I hadn’t already bought a copy as we went in!! Everyone who asked for a dedication got a sketch… every one different!! 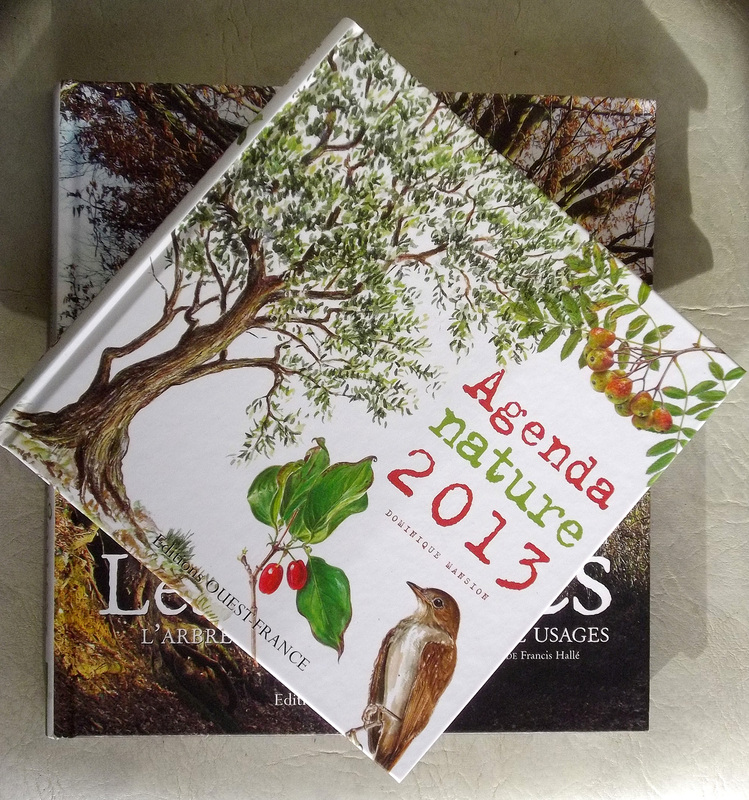 He has also brought out an “Agenda” for 2013, so I bought a copy of that too… not to use as a diary, but a book to record what I’ve been doing to and finding in the field. His illustrations are marvelous… both detailed where needed and beautifully freely drawn where the impression is what counts. The trogne goes back to prehistory… the oldest example of a pollard was found on the bed of the River Trent and dates to 3400 years BP [before the present]… which makes sense as a store of shafts and rods would have been needed then as now. Pollarding, or coppicing, may well have developed earlier than this as man observed the way the trees regrow after being cut…. or, as stated in this book, after beavers had been at work. I have used the term ‘trogne’… this is a French regional word for a pollard… and, because he was told off, as a schoolboy, for using “patois” in an essay when the accepted French term is tetard… he maintained an interest in the trogne and has now documented in this wonderful work, the history, the reasons, the types, the products, the by-products and the wildlife associated with pollarded trees. Well done, that teacher!! This year, I started the first new ‘trognes’ in this meadow… which are already providing cover for birds and food for insects and their predators. In two years time, I will make the next batch…. in three, I will recut this years… and also the first of the old ones. And, in the meantime, the willow species that I have planted here will become trognes… cutting rods at waist height is much easier than coppicing. There will be some areas of coppice though… because as a method for harvesting wood, it supports other species and a different flora. But… there are trognes everywhere in this region… in every vineyard at least one Golden Osier glows in the winter sunshine… providing a source of flexible rods for the vignerons. However, the old pollards… especially the willows… are as neglected as ours were… loosing branches and dying slowly… until they get grubbed out to make the landscape tidier… removing not only the habitat they provide, but history. Fantastic! I wish I’d been there. 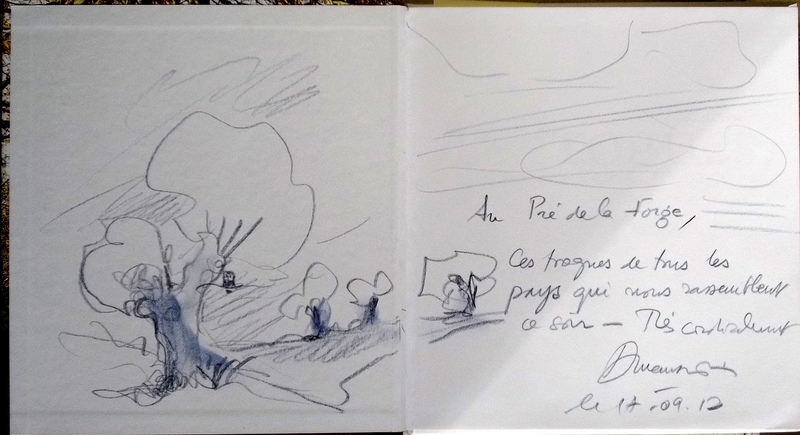 I saw the book yesterday in the café at Ferriere-Larcon. I had to explain to uncle Geoffrey what a trogne was. Did DM explain that trogne means gurn? ie the scars look like gurning faces. No he didn’t… not to my understanding anyway. He is used to giving talks though… he spoke beautifully [and quite slowly]. I think a visit to Boursay is called for! What a lovely talk that must have been! It is such a pleasure listening to someone who is really passionate about his interests. Amelia, it was… my spoken French is not good and my comprehension is only reasonable… but you couldn’t help understanding him… his body language spoke… loudly and clearly!